The rocks were far from perfect. Our 30 year old retaining wall had come tumbling down, and the stone masons were tasked with rebuilding it. They would reuse the rocks, but they’d have to shape them to fit the new design. The old wall had looked a lot like a pile of rocks stuck together with some mortar. The new wall would be superior to the old one and not just because of its advanced construction technique either. It would be a real work of art: aesthetically appealing as well as structurally sound. The work was tedious. Each mason chose a stone and with chisel and mallet, began sculpting it to fit the wall. Gloved hands turned the rock this way then that. Decades-old dirt clods fell away easily; old mortar took a bit more work. Eventually though, the mason would have to knock off parts of the stone itself. He would pound away, turning round rocks into square ones. Once he had placed a reformed stone in place, he’d choose another one and start again. The wall began to take shape. And it is beautiful. Kind of like a church. Think about it: we come together to build something beautiful and strong. 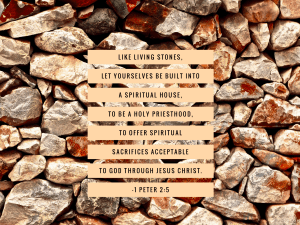 Like the masons working on the wall, God shapes us into living stones. God holds us tenderly in gentle but firm hands, knowing we have everything we need to be the building block needed in this place at this time. Yet we’ve covered ourselves with the concealing mud of shame or conceit, vanity or self-loathing. As we are placed together to form church, God carefully, slowly, and with great love, removes as much of our muck as we will allow. Sure enough, it takes no time for our ugly parts, the ones we wouldn’t release, to scratch against the residue of The Others. It’s uncomfortable, even painful, to have to make space for them. It would be such a beautiful church, if The Others weren’t so muddy and jagged. “They should have let God shape that mess off of them before they came here. They just aren’t going to fit in here like that.” We wince and grumble, making a show of accommodating their faults. Meanwhile, we have forgotten our own smudges and imperfections, concentrating as we are on the defects of The Others. Too often, we leave or The Others leave, seeking a place in a different church, a different community. And the story repeats itself: because no matter where we go, the living stones are imperfect, dirty, and broken. At least that’s what it looks like to human eyes. But what does God see? To divine eyes, do we look like rare gems, uniquely shaped to form this particular church? Do our imperfections look like godly opportunities to grow into who we were created to be? *This post originally appeared at baptistnews.com as "A ragged wall that looks a lot like the Church," on March 27, 2016. "Baptist News Global is a reader-supported, independent news organization providing original and curated news, opinion and analysis about matters of faith." Visit them regularly at baptistnews.com. Thanks! Glad the imagery resonated with you!